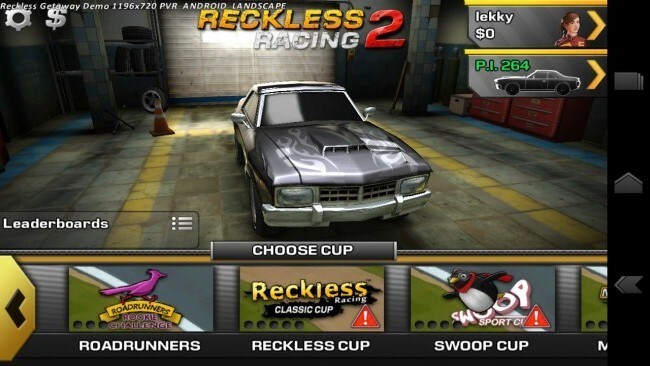 The guys over at Polarbit have been kind enough to send me a pre-release version of their new game, Reckless Racing 2. A new member of the Reckless range of games, and a successor to the hugely popular (and one of my personalÂ favouriteÂ games), Reckless Racing 1. The game will be available to the public on February 2nd in the android market. Career consists of multiple cups, 12 by my count. Each cup has multiple races too. 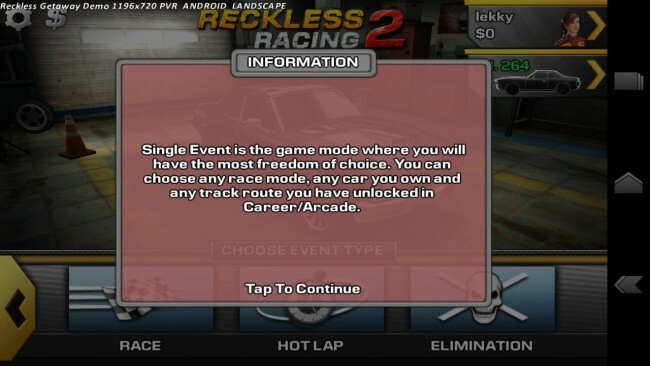 That's a hell of a lot of game content already, and we've only had a look at one of the main game options.Â You race to earn credits which can be exchanged for goodies like new cars, or upgrades to your existing cars. Upgrades includes performance upgrades, as well as looks. A nice feature is the ability to view leaderboards, adding anotherÂ dimensionÂ to the Career mode gameplay. Arcade mode offers a total of 40 tracks. Each track offers you a different challenge, for example place 3rd or higher. If you complete the challenge set for the track, the next track becomes unlocked. 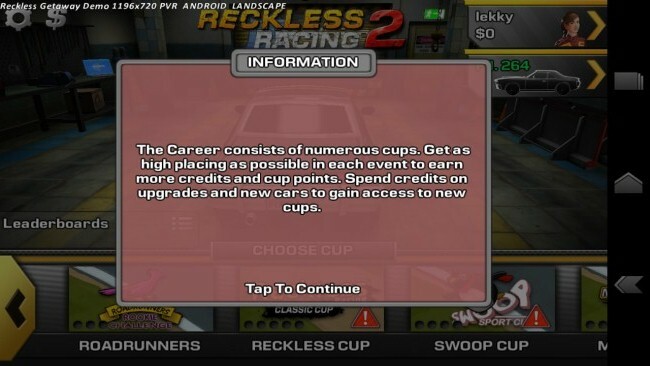 You can also earn credits in arcade mode to upgrade you Career car. Single event essentially lets you do as you please. You can select from Race, Hot lap or Elimination modes. 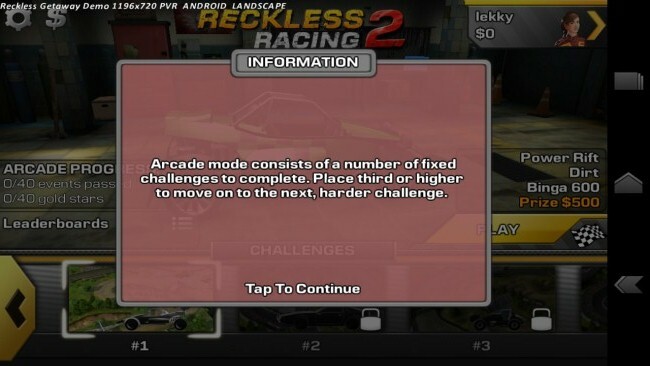 Within each mode you can select from one of 6 main areas, each holding a number of cool tracks to race on. 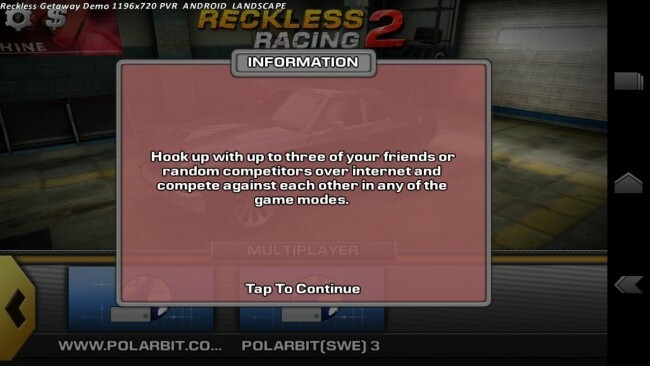 You can play Reckless Getaway 2 with up to 3 of your friends, or against random people over the internet within any of the game modes previously mentioned. Polarbit provide Game Rooms that allow you to search for and join games online. At the time of running through this preview, I was unable to connect to any games, but I'll put this down to the fact the game isn't actually out yet! You can also create your own game room putting you in control of what type of racing you want to play. The Tilt style is the only one that allows you to use your device's accelerometer to move, whilst the others all provide different on screen control layouts. 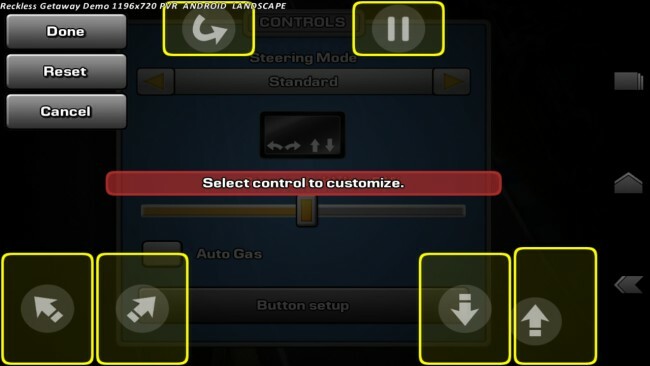 You can also select steering sensitivity as well as auto accelerate. The layout and size of buttons for each layout type can also be fully customised, ensuring the controls will be laid out exactly the way you like. The game offers a few options designed to allow you to get the most out of the game. 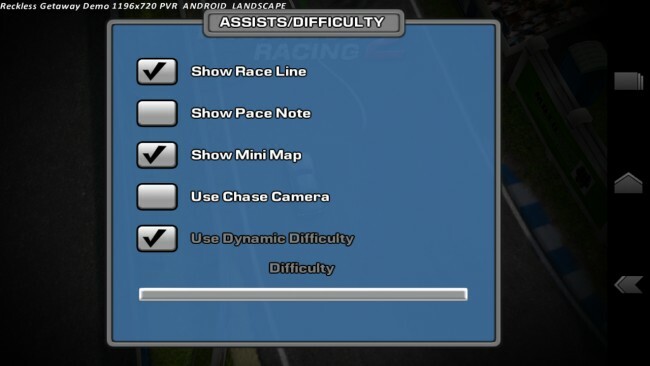 Things like showing the racing line, recommended pace, mini map and camera style are all customisable within the options menu. I'm a big fan of the Reckless series of games from Polarbit, and I have been really excited to get my hands on this game ever since it was announced. After playing through the pre-release version I can say that myÂ expectationsÂ were not only met, but have been pretty much blown away! The graphics have been given a nice clean up, racing is smooth and the backgrounds are quite beautiful. I'm in awe of the amount of content within the game too. There are so many tracks, this is not a game you'll be completing quickly (one of the issues with the previous games). The career mode is a fantastic introduction, especially the ability to buy new cars and completely personalise them. As mentioned, the game will be available on the android market on February 2nd. If you want to make sure you're notified when it is released, I'd recommend following us on twitter for news as quickly as it comes!